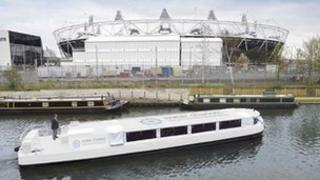 A canal boat company has defended the amount it is charging to get people to the Olympic Park during the Games. Water Chariots is charging £95 for adults and £50 for children for the journey to the Park from either Tottenham Hale or Limehouse Marina. Founder Peter Coleman said the cost covered security and staff, and provided people with direct entry to the Games without having to queue. But local Labour MP Jim Fitzpatrick called the price "ridiculous". He said: "It just sounds crazy - it's way outside the reach of most people's pockets. "A lot more consultation with local residents should have been done at the start." British Waterways said it gave the company a 15-year licence to operate canal boats in the area because it liked the legacy plan it had committed to. After the Games, some of the fleet will be converted into self-hire vessels, creating a canal boat hire base in Limehouse. Some will be available for private charter, while the rest will be used for visits around the area. A spokeswoman for British Waterways said it could not comment on the ticket charges because it was not involved in pricing decisions. Mr Coleman said the boats would take 40 minutes from Limehouse Marina and 70 minutes from Tottenham Hale. He said people would not have to queue because they would be taken to an entrance which would only be used by security and Locog staff and police. "It's the closest link [to the Park] by far - this will be valuable to certain people," he said. "It's about the experience - people are only going to do this once in their lifetime so we want to make it special. We are not taking advantage." Mr Coleman added that an insurance company which had hospitality tickets said it would use the canal boats as it was a "guaranteed way" of getting people to the park on time. He said a black cab would cost more than the amount it was charging. A spokesman from the Olympic Development Agency said its involvement was only in an informal advisory capacity. The River Lea, which the canal boats will use, was last used for commercial purposes in the 1980s.